What Is “Education Reform” and Who “Owns” the Term? It’s hard to speak English nowadays without stumbling over proprietary language protected by trademarks and whatnot, such as the National Association of Realtors’ tagline, “official sponsor of the word ‘home.’” So who or what owns the terminology “education reform?” Typically, the terminology is attached to the advocates of charter schools, school vouchers, and high-stakes teacher testing. That is, education reform is often portrayed as a particular kind of reform associated with funders such as the Bill & Melinda Gates Foundation, the Broad Foundation, and the Walton Family Foundation, just to name some of the better-known foundations behind policies promoting alternatives to regular public schools. 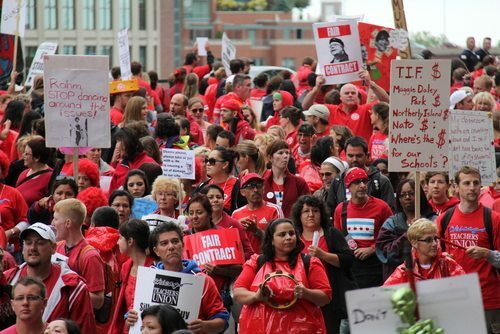 It’s possible that there are other kinds of education reform that do not involve strategies of privatizing the management or even the ownership of K-12 schools or attacking the teachers’ unions. One type of education reform involves equitable financing of public education. In Texas, a state district court judge has ruled that state education funding is “inadequately and unfairly distributed to public schools,” according to an op-ed by State Sen. Carlos Uresti (D-San Antonio). The plaintiffs were approximately two-thirds of the state’s public school districts, which argued that the Texas school finance system doesn’t reflect “the special needs of property poor districts, high dropout rates” and other problems in some school districts that have been exacerbated by the state legislature’s decision to slash $5.4 billion from public education funding. The sad reality is that, contrary to Uresti’s hopes and dreams, we think the state, like most states facing school funding equalization cases, will appeal and make the case drag on and on and on. In New Jersey, for example, the equalization cases started with Robinson v. Cahill around 1970 and despite some progress, funding disparities have reemerged. Take it on faith that “property poor” public school districts with high proportions of students facing a vortex of obstacles such as poverty, language barriers, and racism generally don’t have easy access to large grants from big foundations. Moreover, some of the highly touted successful reforms, such as charter schools and testing, don’t always live up to their hype; we’ve seen mixed results on charter school performance and numerous scandals around school test scores and student performance in cities such as Houston, Atlanta, and now San Jose.